You might have noticed that I am an overly precise knitter. When I’m working from a pattern, I’d much prefer to count rows than fiddle with a measuring tape. When I measure my knitting, I can’t help but wonder if my working gauge is really the same as my blocked gauge, even if sections I check indicate it is, or if I stretched my knitting too much when I smooth it out. I just end up worrying about it, and I don’t like it. Patterns aren’t always written with rows, but it’s pretty easy to get that number. Once you have a big swatch that’s blocked so you know your row gauge is accurate, you just need to multiply the length you’re supposed to knit to with the number of rows per inch. This is especially useful if your stitches grew after blocking, and you can’t accurately measure your knitting while it’s still on the needles. If you knit the precise number of rows, your knitting will block to be the intended length. 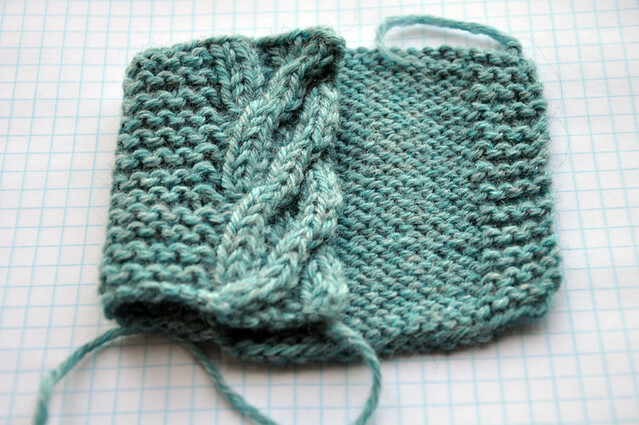 It’s a really simple trick that seems obvious when you think about it, but it took me a long time to realize that I could work around measuring my knitting. So, do you measure your knitting or are you a row counter? I actually weight and hang my swatches when I’m using unfamiliar yarn. It’s an extra step, but it’s an important one. I’m with you 100%! I only knit to length when I know the precise length doesn’t matter exactly or that I know I can for sure block it the way I want it (like if it’s a yarn I use a lot and I know my row gauge doesn’t change much with blocking). Otherwise I go by number of rows using my row gauge. Way more accurate! It prevents things like overly long sweater bodies or armholes that are too deep. I both measure and count rows. I really prefer counting for the same reason as you — it seems more precise. I’m always afraid that on the second sock (or the front of something or the other sleeve) I’m pulling or stretching one piece more than the other and the measurement is off. When I can count rows – particularly pattern repeats, since I can’t count very high without losing track of where I am – I prefer counting row to measurement but use both to cross-check. That said, I still end up with uneven parts, which drives me crazy! Ugh – COUNTER! When I crochet and they tell me to “measure” things, I really don’t. Ever. Instead I hold it up to my body or someone else’s and eye it. And that’s only if they are forcing me to measure and not count. Otherwise, I find a way to figure out how many rows, how many stitches, etc. Through blocking, even if two panels of a sweater are slightly off from each other, I can make it work just fine! I prefer to measure, but you make a good point about the row gauge issue. Honestly if I had a yarn that was a real shape shifter when it got wet, I would probably convert the measurements to the post blocking length. ie if 4 inches grows to 5, I would multiply all the measurements by 4/5. I guess I do a little of both. I’ve never thought about it before! Definitely a counter! I’m very precise too with my knitting – especially if knitting things that need to be seamed or things like sleeves where there’s two of the same. I’m also always unsure of how much to stretch things when measuring (I sometimes measure to double check my gauge is still good), but figure most things can be fixed with blocking. I have been burned by blocking too many times. I’m a row counter now. But I do enjoy measuring my pieces as I go. It feels like progress when you have a measurement to look at. Definitely a row counter… I like patterns where row number AND inches are given. This way, everybody is happy! I count rows for things like socks or mittens when I want the two pieces to be identical. I measure for things like hats where it’s only one item and it doesn’t much matter if it’s off a small amount. If a measurement is given, I measure. Sometimes if I get impatient with how slowly it’s growing (like the body of a sweater) I’ll measure, do the math, and then count rows. For something I have to do twice, I measure the first time, count the rows, and then count for the second one. It helps keep it the same for me. interesting! I always measure, I hate counting rows. But I’m not a precise knitter, I like winging it a bit, and feeling out the knit as I go. I do both depending on what I am making. I count rows especially when I am making a duplicate or sets of pairs (socks, mittens, etc). OMG why didn’t I think about this before! Great Idea!